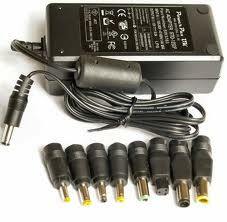 Spring cleaning, and I'm trying to get power supplies for all my devices with missing power supplies. They're all the typical barrel power connector, and I'm having a dickens of a time trying to figure out the pin/hole diameter. I ordered the power supplies I needed based on outside diameter (e.g., 5.5mm in my example below) and was surprised to discover that while the jack fit, the center pin did NOT. How do I prevent this from happening in the future? Do they even make calipers that can get into the hole to measure the pin diameter? Radio Shack has their little keyring behind the counter with every known tip size, but all they can get from that is which stock number fits on their universal wall wart. Personally, I think that these types of "universal" kits are the worst thing to happen to electronics in, like, FOREVER. Too many parts to misplace and the tip-to-cable connector is almost always proprietary. If I try to pump them for information about what the outer and inner diameters are, they want to know if I'm happy with my current cellular provider. As you may surmise, I'm not a big fan of trusting my local Radio Shack for electronics guidance. So...that leaves me with a bunch of power supplies that don't fit their devices, and me a little peeved that I have to deal with RMAs, return shipping, etc., especially when I really don't have a clue how to figure out what to order. That also begs the question about how to ensure that I buy the right jack when designing something that NEEDS wall wart power. Where do I even start? Anyone have any ideas on how to finding the correct barrel & pin diameters when I don't have specs on the jack? Is it really trial and error? or is there some measurement device that's available to help? Those are barrel power connectors. Looking at Digikey, it looks like common inner diameters with a 5.5mm outer diameter are 2mm, 2.1mm, and 2.5mm, but that doesn't mean that your target application doesn't have a custom size which doesn't match any of these. The one I usually use for my projects is 2.1mm*5.5mm if I can, but as far as I know this is by no means a rule of thumb. Knowing what the jack is being used for may help in identifying a correct size. Just look up a fractional inch to mm conversion chart. Then break out the drill bits. Vernier calipers can be used to measure both the inside diameter (i.d.) and outside diameter (o.d.). This works if you have only the device (receptacle) or the supply (plug). If you're using calipers, then use blue tack or something similar to make a mould of the internal dimensions of the plug or socket and measure the mold. An additional caution I learned the hard way: if trying to fit an appropriate barrel plug to a barrel jack, do not get a barrel plug which is exactly as wide as the jack. If you do this, you will not get good connection with the center pin, because that is made by the jack's sprung outer contact pressing the (rigid) plug sideways against the center pin, which can't happen if the plastic shell holds the plug centered. Wikipedia has a conversion matrix with conversions between the radioshack letter codes and actual measurements found here this way you can use the radioshack keyring to find an appropriate size connector and then buy the correct adapter. 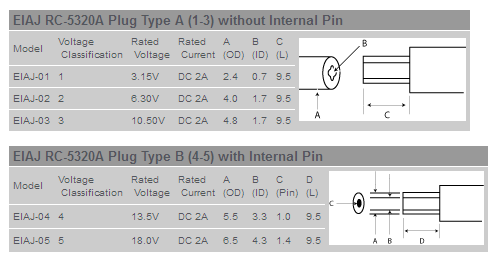 Differentiating between 2.5 and 2.1 mm plugs is very simple. Strip the insulation off of a #12 solid wire- used commonly to wire houses. 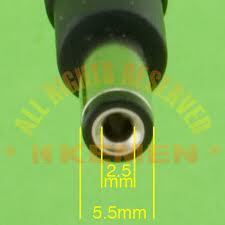 It is 2.05 mm diameter and will be loose in a 2.5 mm plug. It will just fit in a 2.1 mm plug and can only be slightly wiggled. I found that the easiest, but not the cheapest, way to determine the inside diameter of a 'barrel' connector is to use a set of "pin gages" which are hardended and ground to precise external diameter steel 'rods' that come in sets. A lot of times sets are available cheaply at discount tool supply places, or if you have a machine tool supply store available, individual gage pins can be ordered. Then you just take a 'pin' and try its fit in the inside of the connector. Be careful if anything in the connector is gold plated (doubtful) as the ends of the 'pins' are capable of scratching the plating off their being 'as machined' and not debured. I have not verified this, but a possible solution may be to use a spark plug gap tool. I have one that uses metal wire loops embedded in a plastic disk. I bought it years ago but I still see them around. Just snip the loops and bend them straight for an instant ID estimator. My disk has both metric and inch labeling. Hard to beat the price. Not the answer you're looking for? 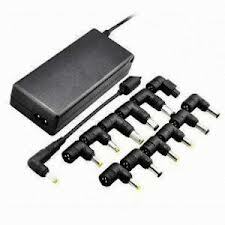 Browse other questions tagged power-supply connector or ask your own question. What should I know about “press fit” connectors? 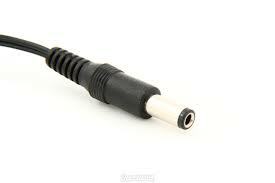 What kind of “locking” barrel connector is this? Which is most used Barrel Connector ID? 2.1m or 2.5mm?